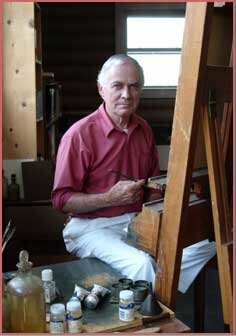 Ther Art of Thomas G. Riley - JaiBaba.com! Your Avatar Meher Baba Oasis on the net! Tom's boyhood was spent in Woodstock, NY, where many important artists have lived and worked. The area attracted spiritual teachers as well, such as Rabindranath Tagore and Vivikenanda. At the age of 16 Tom began studying with an elderly painter who had come to Woodstock in 1904 to help found the Summer School for the Art Student’s League, an important American school of art. Tom attended Temple University outside Philadelphia, and later studied art history and art conservation at the New School in New York City. Tom then spent many years in Woodstock, with his wife and two children, Christina Mehera and Demian Meher. It was there that Tom first heard of Meher Baba in 1954, which initiated his life-long preoccupation with Him. Not long after that, Tom began correspondence with Adi K. Irani, Baba's secretary, which lasted until he met Meher Baba in Myrtle Beach, SC in 1958. In 1962 he again had the opportunity to be with Meher Baba in India at the "East West Gathering." Tom lived for many years in Myrtle Beach, SC near the Meher Baba Center. He presently reside in Asheville, NC with my wife, Catherine Haas Riley. Here are a few samples of Tom's wonderful art, Enjoy.